What a God we have! And how fortunate we are to have him, this Father of our Master Jesus! Because Jesus was raised from the dead, we've been given a brand-new life and have everything to live for, including a future in heaven--and the future starts now! In Peru there are four New Testaments to be printed within a year. And now that my publications responsibility has extended to several other countries in Latin America I am coordinating another six New Testaments for Guatemala, Colombia, Bolivia and Ecuador. 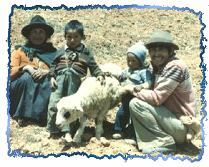 In January, 2002, Ralph Toliver (translator working with the Ambo-Pasco Quechua in the Andes of Peru) was working on Matt. 11:28-30, where Jesus says, “Come unto me, you who are weary and heavy-laden, and I will give you rest.” He thought that this passage would be easy for the Quechuas to relate to with its figure of burdens. 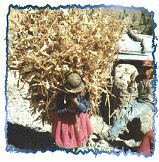 Quechua people are always carrying large loads, and often over long distances. You can picture an old woman walking up the street with a load of corn stocks so big it almost hides her, and men commonly lift and carry 50 to 100 pound bags of potatoes or corn. They would understand what it means to have rest from a heavy load! Lorenzo Albino, Ralph’s co-translator, said that it would be difficult to preserve the figures in the translation in such a way that the meaning was clear. But he began pondering over these verses, and when they sat down to work on them, the translation just poured out of him. He just dictated all three verses on the spot! Ralph plans to print Acts this year. That’s why we are willing to spend our lives in this ministry. We are so thankful for those who faithfully supporting us through prayers and finances. One Sunday after their own church meeting, a contingent of Zapallo Grande believers arranged to go 45 minutes upriver by motor canoe to Loma-Linda for a Christmas celebration on Dec. 23, 2004. There they met 210 people gathered for the occasion. They distributed candy bags along with 300 pamphlets based on the Chachi translation of John chapter 1. Juan Bautista Añapa, the Chachi pastor at Zapallo Grande, led the meeting in the new but partially built Loma Linda church. Can you picture this crowd of people clustered around the DVD player and a small TV watching the Chachi Jesus video? They only got half way through before a number of people started asking how one becomes a Christian. So Juan interrupted the film to explain. Twenty-one people accepted the Lord. I wonder if they were able to finish the showing? Neil and Ruth Wiebe have spent many years preparing the Chachi translation. Last week Neil had gall bladder surgery. But they are still planning to do the layout soon. On Friday, January 28th, our dear son, Ondrej, and Jessica were married before a judge in a civil court. We are thrilled for them. May Father bless them in their exciting lives together, no more as two individuals but as a unity under God. Ondrej continues to work as a mechanic at the JAARS Center near Waxhaw, NC. Jessica is attending University, studying to be a teacher. They plan to have a wedding Celebration Ceremony on August 23rd near Charlotte, NC, when we will be able to celebrate with them. And my precious daughter, Loris, is making wedding plans to marry Thomas, on July 23rd in Lancaster. With all these exciting changes in our family we are looking forward with great joy to spending time together for a couple months this summer. In the unfilled spaces of summer activities we plan to visit all our friends and supporters spread out from Dallas to Winnipeg. We would really appreciate prayers as we make contacts and pencil in the calendar. If you live near Dallas, Charlotte, Akron, Chicago, Toronto, Ottawa, or Winnipeg, we hope to be able to see you and enjoy some time together. My dad was volunteering at the JAARS Center when he began to experience some heart trouble. He flew back to Winnipeg where he underwent a successful quadruple bypass. We are so thankful for his positive recovery. Now we just have to figure out how to get his car back to him. On the other hand maybe we can enjoy his blue hot-rod while we travel. Thanks for your prayers for our home life. We constantly see God’s provision and experience his blessing in our family. 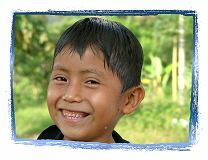 And that has made a big difference in our ability to minister for Bible translation in Peru.